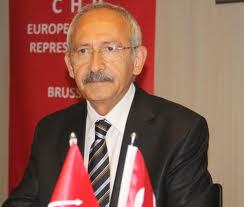 Main opposition Republican People’s Party (CHP) Chairman Kemal Kılıçdaroğlu jokingly suggested that the week between Dec. 17 and 25 be celebrated as “Thieves’ Week” every year, a reference to a corruption investigation concerning top government officials that went public that week last year. Kılıçdaroğlu commented on Saturday on a decision by the İstanbul Chief Public Prosecutor’s Office on Friday to drop charges against the suspects implicated in one of Turkey’s major graft probes. “After all this, the week of Dec. 17-25 should be declared ‘Thieves’ Week’ and celebrated by the thieves at AK Party [Justice and Development Party] headquarters." The İstanbul Chief Public Prosecutors’ Office dropped the charges against 53 suspects standing trial in the corruption investigation. The highly-publicized investigation, which kicked off on Dec. 17, 2013, and was labeled by authorities as a "coup against the government," implicated the sons of several ministers, pro-government businessmen and the chief of the state bank. At the heart of the probe was Iranian businessman Reza Zarrab, who was allegedly involved in a money-laundering scheme as part of his strategy to bypass US-led sanctions on Iran. Barış Güler and Salih Kaan Çağlayan, the sons of former Cabinet ministers, were also among the suspects whose charges were dropped. CHP Secretary-General Gürsel Tekin said in an interview with the Hürriyet daily on Saturday that members of all the CHP’s provincial branches will go to courthouses on Monday and leave a black wreath in protest of the prosecutors’ decision.